As if the cakes and other confections don’t sell out quickly enough at Café de Lion, a little “boutique” bakery at the top of Queen Anne in Seattle, chestnut season means the brief appearance of the popular Mont Blanc ($6.00). 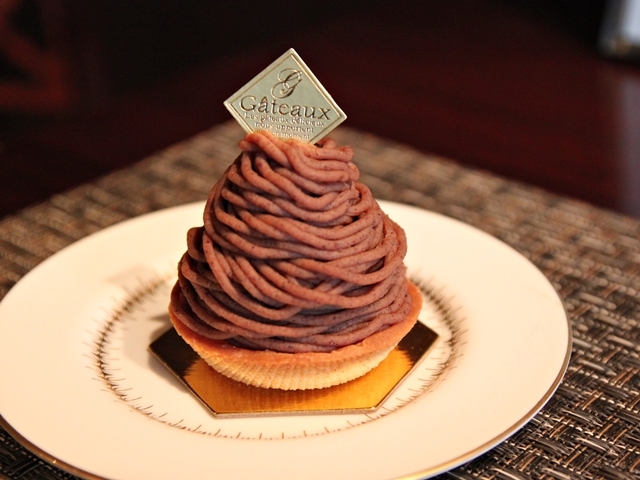 The dessert gets its name from the famous peak in the Alps, which it resembles with its spaghetti-like piping of sweetened, puréed chestnut atop an almond tart shell base. Most make Mont Blanc with canned chestnut purée, but not Tomoyo Miura, who takes pride in creating everything from scratch. (She even makes her own food coloring so that it’s completely all-natural.) While her Mont Blanc is not dependent on the immediate use of the current crop of chestnuts, it evokes the spirit of the season by using a compote of chestnuts that have been soaked in an Earl Grey tea mixture for one year. And while other Mont Blancs have a simple spongecake base, Miura grinds almonds to make a sophisticated tart shell that adds texture to the dessert. There are a few small tables to stay and enjoy your sweet treats, or you can sit at the counter while Tomoyo’s partner Daisuke brews some of the best coffee in the area. If you’re planning a visit, keep in mind that Café de Lion offers just a limited number of sweets each day and the shop closes as soon as the day’s desserts sell out—it’s smart to call before opening to reserve your order. And at this time of year, that order should be the Mont Blanc.